The Air Force has the reputation of having the best quality of life programs (dormitories, family housing, on-base shopping and services, and recreation) of all the military service branches. That's probably because the Air Force got a head start in using a significant portion of their funding to establish, maintain, or expand their quality of life programs. All airmen (except basic training, technical school, and at some remote overseas assignments) now get a room to themselves, which may not sound like much, but it can be a major perk when you've spent all day in training and need some alone time. How has the Air Force addressed quality of life on its bases for its airmen? Here are a few areas where this branch of the military concentrated its resources. (Note that "airman" is the Air Force's generic term for its troops, like "soldier" in the Army or "sailor" in the Navy. An airman can be male or female.). The Air Force converted its living quarters for airmen into single-occupancy years before any of the other services. The Air Force standard is the "4 x 4," which houses four airmen in a dorm with a shared common living area, complete with a kitchen and living room. However, each airman has his or her own bedroom and bathroom. At most bases, airmen in the rank of E-4 and above with at least three years of service can move off base and receive a monetary housing allowance, called BAH. Like the other services, the Air Force converted existing on-base family housing to military privatized housing. Under this concept, civilian companies are encouraged to construct, maintain, and manage military-only housing complexes on and close to military bases. The Air Force program is called housing privatization. More than 30,000 units across the United States were updated in the mid-2000s, at a cost of around $4 billion. At most bases, married airmen are given a choice of living in family housing or living off base at a place of their choosing with a monthly housing allowance. This is particularly appealing to airmen with small children, or who are starting a family. Airmen authorized to live off base at government expense and those who live in family housing receive a monthly food allowance, called BAS. 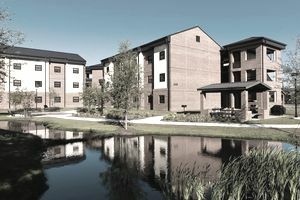 Those who live in the dormitories do not normally receive this allowance but eat their meals for free in the on-base dining facilities (chow halls). All Air Force bases have a wide array of recreational activities both for airmen and their families, including rec centers, swimming pools, intramural sports and even the Green Knights motorcycle club on some bases. As with other branches of the military, when airmen are deployed on active duty, there are a whole host of amenities at Air Force bases to keep families safe and create a normal day-to-day atmosphere.